What are the first images that pop into your head whenever someone says the word “Christmas”? If in doubt this christmas, look at this chart, however our minds typically drift to images of family or loved ones, snow, Christmas trees, Christmas lights, presents, and – of course – Santa Claus. So, it’s fair to assume that if someone shouted “Barbecued Glazed Ham!” in connection with Christmas, you’d probably think they were just a little bit different. Am I right? The truth is that a lot of families serve a delicious ham as the centerpiece of their Christmas dinner, so why not take the opportunity to jazz up your Christmas meal by serving that traditional ham straight off the barbecue?! I highly suggest to check guidr to find some awesome tips. Years ago I was given a recipe for one such ham, an Orange Soy-Glazed Ham. My mouth watered as I read through the recipe so I figured it was worth a shot, even if it was more than a BIT unconventional to be barbecuing anything in December! Long story short, I’m glad that I decided to roll the dice and step outside of the norm, because the ham turned out delicious, and a new tradition was born in my household. 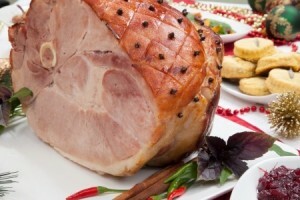 So, read on and learn how to spruce up your Christmas dinner with my “Orange Glazed Barbecued Ham”. Naturally, the first thing you’ll need to do is get the grill ready. I use a charcoal chimney, but just use whichever method you like best to make sure you get the coals going! Obviously, this is a very important step. Okay, now while the charcoal is getting all nice and hot, you need to turn your attention to the ham. First, take a sharp knife ( use a proper electric knife sharpener to get it absolutely sharp) and cut around the entire edge of the rind on the leg. Press your thumb up under the rind in order to separate from the fat, and then remove the rind and get rid of it. With this same sharp knife, score the fat of the ham diagonally so that you form the traditional diamond pattern with your cuts. Take the whole cloves and press one into the corners of the diamonds. Place the ham onto a wire rack in a foil baking pan, and then add boiling water to the pan so that there is approximately one inch of water in the bottom of the pan. Now, you get to mix the glaze together. In a medium bowl, combine the orange marmalade, brown sugar, ground ginger, and soy sauce. Mix the ingredients well, and then brush just half of the resulting glaze over the ham. So, now you have the ham ready to get out to the grill. So, you need to make sure the grill is ready to receive the ham! Take a disposable foil baking pan – similar in size to the one that you have the ham in – and lay it in the bottom of your grill. Now, spread the hot charcoal all around the foil pan so that it is completely surrounded. Place the grate on the grill, and you’re ready to go! Place the foil pan containing the ham on the grill directly above the foil pan in the bottom of the grill. Cook the ham, with the cover of the grill closed, for 40 minutes. By placing the ham above the empty foil pan in the grill, you are allowing the ham to cook evenly over indirect heat. Brush the remainder of the glaze over the ham. Continue to cook the ham, with the cover of the grill closed, for 50 minutes or until the ham is caramelized and slightly charred. Remove the ham from the grill, and allow it to sit for 15 to 20 minutes. Remove the cloves from the ham, toss them aside, and carve that ham up because it’s time to eat! There you have it! Why not give this easy recipe a shot this year for your Christmas dinner? Yes, Christmas is a time of honoring traditions, but who says that you can’t begin a NEW tradition every now and then?